We're in the FINAL days of Early Bird pricing to attend the fourth annual Sustainability and Circular Economy Summit May 9—10 in Washington, D.C.! Register before March 30 to get the lowest rates. 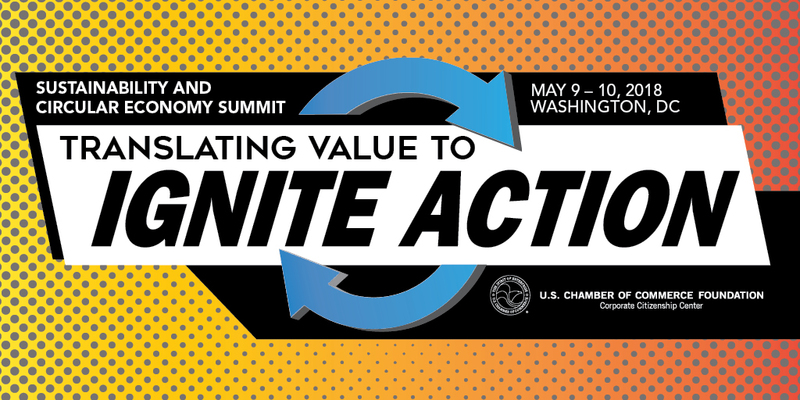 Join the U.S. Chamber of Commerce Foundation May 9—10 in Washington, D.C. for the fourth annual Sustainability and Circular Economy Summit, Translating Value to Ignite Action. Gain the practical knowledge, skills, and applications needed to most effectively implement circular economy communication strategies, both within and outside their organization. Connect with top sustainability professionals through unique networking opportunities. Hear from our lineup of speakers sharing their stories on what has (and hasn’t) worked within their organizations. Discover emerging trends around these issues, and how to best communicate the value of sustainability and circularity as a business strategy to a wide array of business units and consumers. Early Bird prices end March 30, so make sure to register now before it's too late! Final 2 Weeks for Early Bird Pricing!